The latest Field Notes come from our youth volunteers who are now serving in Mexico at our children's home through a service trip coordinated by Silver Lake Conference Center in CT! The first entry is from Camryn Cicarelli of Sandy Hook, CT. The second reflection is from Danielle Peterson of Stratford, CT.
Sunday was our first full day at Casa Hogar Simply Smiles. We began our day by preparing pancakes and having morning reflections, where we learned about our tasks at hand and how they would not only help Simply Smiles, but also the people of Oaxaca. Before beginning our jobs we took a tour around the neighborhood of San Bartolo Coyotepec. It was incredible to see how the people of Oaxaca live; it also made me appreciate how fortunate I am. Each person we passed would smile and say hello (of course in Spanish) which was representative of the unity in this community. Camryn (left) and fellow volunteer, Katherine, pass cement bricks for an expansion of a patio at Casa Hogar Simply Smiles. Once we were assigned our tasks, the long day began. I spent the afternoon moving a pile of sand and gravel in preparation for some cement mixing to expand the facility for more children in the future; under the intense Mexican heat, this task felt insurmountable. The feeling of finally completing the task was intensely rewarding. In the late afternoon we visited Casa Hogar Benito Juarez, the first children’s home that Simply Smiles supported, which was a life-changing experience. At first I didn’t really know how to communicate with the people there. But as the night progressed, communication became natural. We first made bracelets with some of the children. Although nobody could actually figure out how to assemble them, we shared lots of laughs. One moment that I really cherished was when a young blind man named Nacho picked up the guitar and played like nothing I had ever heard before. Another notable moment of this night was playing basketball and soccer with a few of the boys at Casa Hogar. I was way too confident going in, and was quickly put in my place when a boy half my age dribbled right past me, leaving me in the dust. It was such an amazing feeling knowing that we were able to make all the people there smile, even if we were just there for a few hours. Overall, the day gave me a chance to see how a person thriving in this community actually lives. Also, it allowed me to see how important an organization like Simply Smiles is, and the power we have to impact a life. The Silver Lake volunteers with the children of Casa Hogar Benito Juarez. After the hard work day on Sunday, most of us were able to sleep pretty soundly, which was much needed. Monday began with a pre-breakfast yoga session led by Jen, which helped center our minds and mentally prepare us for the full day we had ahead of us. Plus, the stretching really helped our sore muscles from yesterday! Again, we split into various work groups, with some of us mixing cement, some reorganizing the bodega storeroom, and some cleaning decorative bricks for the new children’s rooms, among other jobs. I personally worked a lot on the roof laying bricks for the new patio, which was challenging due to not only the hot sun, but also the fact that Simply Smiles local foreman Javier and his crew accepted nothing less than perfection, which is understandable. The way it was explained to us was to do as well as we could, and to complete the work to the quality that you’d want for your own house— there is no “good enough”. Danielle paints the exterior of a new laundry room at Casa Hogar Simply Smiles. After lunch and some more work, we were able to travel to the Oaxaca City Dump, which was an eye-opening experience. All the trash and waste from the city end up there, and there is no separation between innocuous ripped clothing and toxic human waste. The pile has been growing exponentially, to the point where is it nearly overflowing into the communities nearby, and the government isn’t providing any kind of aid. The people in the community begin work at the dump at sunrise, picking through the often toxic trash for small pieces of plastic and anything of value that they can sell. For many, this is their only source of income, which adds up to about $1/day. Regardless, families were extremely welcoming and opened their homes and the community to us, even though they know we live very different lives than them. Something we talked about at night during reflections was how easy it is to fall into pitying them. It’s very tempting to just come in as “saviors” and do what we think is best, when in reality that may not be what is best for them. This is one of the biggest initiatives of Simply Smiles, which I think is very important to its success as an organization—to come in with open eyes and ears and listen to the communities and what they need in order to not only survive, but thrive. We were invited into the first home that Simply Smiles built, for a woman named Edith and her family, and it was amazing to see where Simply Smiles began its work in the dump. Although the conditions are still far less than ideal, Edith and her family take immense pride in their home and the restaurant that they were able to open to further support themselves (the sandwiches are delicious). Overall, I’m very grateful for my experience at the dump— it’s very easy to turn your head away from things like this, but we made sure to feel this experience fully in order to show respect to the people living there. The work projects were physically demanding, but this was mentally taxing, and I’m glad I was able to experience it. Now, the important thing is to spread awareness of the injustices these hardworking, gracious people face every day, and to do something about it. The initiatives of Simply Smiles are working toward this goal, and I’m very glad I can experience this work first-hand and serve as an amplifier for the voices of the people of Oaxaca. Field Notes from the Reservation: Day one - latrine hole digging, ultimate basketball, and having "a hoot and a half"
Today's Field Note is brought to you by volunteers Amber Heil, Kayla Skaletski, and Cassie Van Buren, students from the University of Wisconsin - Stevens Point. Below, they describe their first full day (Sunday) in La Plant, full of work projects and meeting the people in town. Today was a fun-filled day of work and excitement. The first thing on our agenda was a tour of the community and the community center. Sam gave us a lot of information regarding the historical perspectives of the Lakota and locations of the possible work activities we will be helping with throughout the week. After lunch, we chose what activities we wanted to participate in today and went our separate ways. Some of us helped repair broken latches on doors (damaged by South Dakota wind), others painted signs for the garden shed, a couple of us helped to build bunkbeds for all the interns coming this summer, some helped prepare for the community dinner that was held this evening, some organized the craft supplies for camp this week, and the lucky ones helped to start the process of moving the latrines. The UWSP crew starts building bunk beds! One thing we learned was to not dig too deep around the latrines or you will break the seal and may not like the smell. After our work duties, we all helped to set up for the community dinner. We had the opportunity to ride on the bus and pick up community members for the dinner. Everybody was excited for the mac and cheese that was prepared. After dinner, the elders and people that didn’t want to get wet stayed in and talked or played games and everyone else went outside for a game of ultimate basketball. Some of us volunteers and some of the kids went outside to play basketball, which was awesome! We couldn't believe how good the kids were! It was so fun. It has been a long time since any of us have played in the rain. We were drenched but we had a hoot and a half. We can’t wait for tomorrow to have the first day of camp with the kids! Today's Field Note is brought to you by four-time Reservation volunteer, Kerri Colombo, who just returned home to Connecticut after her latest trip to La Plant. As this is my fourth trip to La Plant, in many ways it feels like returning home. Each year the week seems to pass more quickly than the year before. It feels as though I am just getting reacquainted with my Lakota friends and it is almost time to pack up and leave again. A friend and elder asked what it is that I think when I return to Connecticut. I explained that I worry for my friends here. I check the weather conditions in La Plant throughout the year and hope that their propane does not run out during the harsh winters. The freezing cold rain, snow and whipping wind at the beginning of our week in La Plant gave us just a very small taste of the severe conditions of living on the Plains (it was about 27 without taking the wind child into account). My friends and elders did run out of propane this winter. I am thankful that it was a relatively mild one. But in La Plant, 6 degrees is considered mild (it can drop to 50 below zero in the dead of winter.) Still, in their poorly insulated trailer the bitter winter could not be kept at bay. Their children and grandchildren had to move out for a while. It was just too cold. My friends stayed behind. They survived another winter. I am thankful that we were still able to share a meal this spring. Throughout the year, I wonder if my friends here have enough to eat and if the children are experiencing love and affection each day. I hope that the elders feel connected and cared for, and that friends who struggle with addiction will have a good day and carry on. I fear that my friends will not receive proper medical care. As I told my friend, it is as much the individuals here as it is the unique Simply Smiles experience that brings me back each year. I believe in the hope for the future of this town, and the approach of the Simply Smiles team. I feel a connection here that I can't really express, except to say that I look forward to returning again to the special individuals I have been blessed to become connected with. Their stories have become my stories as I feel the threads of their lives interwoven with mine. Help our bus get a friend! Field Notes from the Reservation: Flexibility is fun! Today's Field Note is brought to you by Jennifer Dupont, a long-time volunteer of Simply Smiles from Naugatuck, Connecticut. Her message: Learning that flexibility can be - and is - fun! Good afternoon from sunny La Plant, South Dakota! What a difference a day makes! We went from freezing rain and snow to sun and wind in just a 24-hour period. As the Simply Smiles motto goes, "flexibility is fun." This is my third trip to the Reservation, and I almost didn’t recognize it when we drove up. There have been so many changes and improvements in just one year: the impressive horseshoe pits, the huge garden and high tunnel, the full size basketball court, the beautiful pow wow grounds and the incredible tipis. It is certainly a welcoming place for the children and adults and these features are now a prominent part of their community. Yesterday was our first day of camp, and the big hit this year is Gordon and Elliott’s Giant Jenga game! They were only half way completed with it and the kids were already having a blast playing. There was coloring, crafting and game playing, but my favorite was the snowball fight with the kids. My only regret was not having brought gloves with me - they would have really been in trouble then! Balancing act: The life-size Jenga game required concentration...and lots of deep breaths from participating campers! We have been working on the garden, getting more beds ready for planting and finishing work on the new house. Not enough hours in the day to get it all in! I am sad when we have to stop working, and I haven’t completed my project but then I realize I get to play with the kids. I am sad when the kids all go home but then I realize how exhausted I am. I wish I could put into words how much this place and everyone here means to me. I am so grateful and blessed to be able to have this opportunity to be a part of something as special as this. Thank you Simply Smiles staff and interns for always taking such great care of us! At Simply Smiles, we are humbled by the ongoing support and participation of our volunteers. Our volunteers make our trips possible; they strengthen our relationships and partnerships in and among the communities and individuals we serve. Yoonjong "YJ" Lee is one such volunteer. 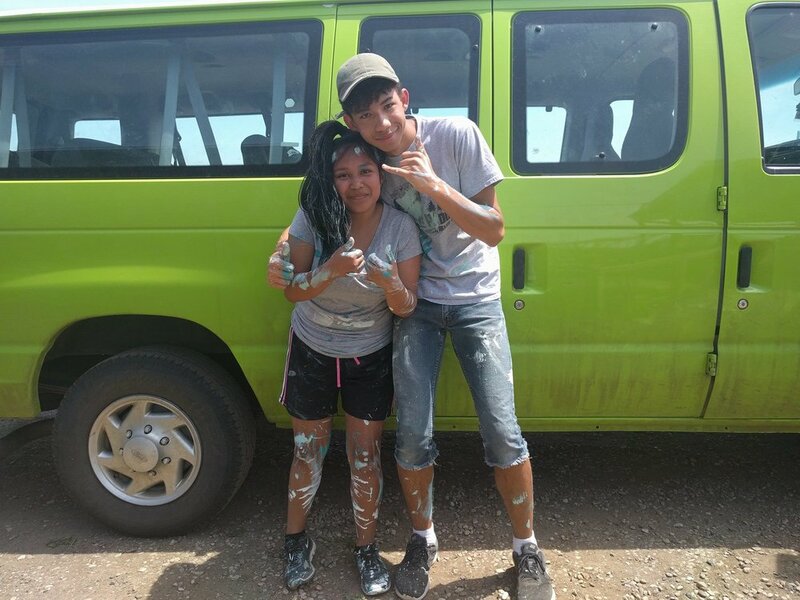 Below, he shares his insights from his second service trip to Oaxaca with his Choate team.